The Power of Goals. 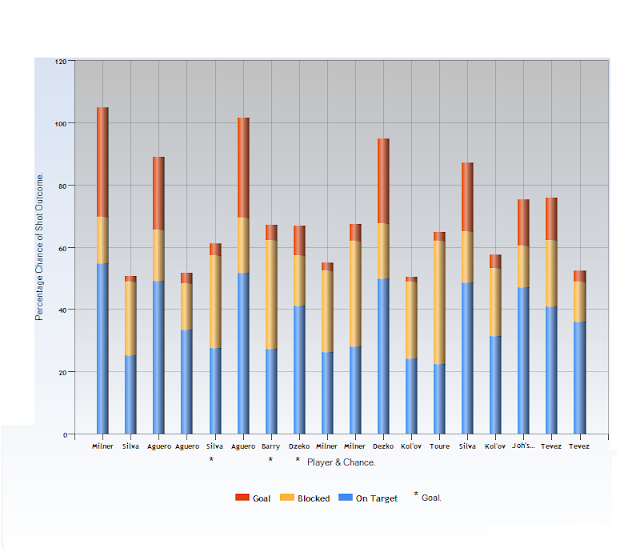 : Shot Analysis Of Bolton v Manchester City, 2011/12. Shot Analysis Of Bolton v Manchester City, 2011/12. Manchester City, Bolton Wanderers, Gavin Fleig and Opta have recently released advanced level data for the 2011/12 early season game at the Reebok, between the two respective sides. The data provides a play by play account of the game, where each action throughout the match is described in minute detail. The most important addition to the earlier aggregated data release is the inclusion of the so called x, y co ordinates which allows a degree of context to be introduced to any analysis. Inclusion of pitch position and also game state begins to make it possible to begin to quantify the importance of major in game events and investigate more thoroughly each team's differing intentions during various stages of a match. One of the most readily identifiable match event is attempts on goal and the new data release enables such chances to be quantified. Potentially this adds insight to the events on the day and reveals an extra layer of information to supplement the previous performance indicators based solely around goals and match result. Anticipating the level of expected superiority between two opponents in a low scoring sport such as a football match is difficult. The average number of goals scored per game in the Premiership hovers around 2.5 goals and even in the biggest of mismatches when top play bottom, the superior side is on average rarely more than two goals superior to their opponents. Home sides on average are around four tenths of a goal superior to average away sides, but it's difficult to make a "goals only" judgement on either of these mythical side's performances if the game ends in say a single goal win for the home side. By quantifying each chance created, especially with regard to how likely each chance was to produce a goal, we can begin to look at overall performance rather than performance based merely on result. Manchester City visited Bolton on week two of the 2011/12 season, both had opened their campaign with 4-0 wins, City at home to Swansea and Bolton away at QPR. However, a more accurate estimation of the respective merits of each side could be found in their records from the previous year. Two average Premiership sides from that season, meeting at a neutral venue again and again would have shared around 2.8 goals on average. Therefore, Bolton's overall record of 52 goals scored and 56 conceded marked them down as a slightly below average attack and a below average defence, fully consistent with their finishing position of 14th. In contrast, Manchester City's 60 goals for and just 33 against indicated above average ability at both disciplines, again fully consistent with a finishing spot of 3rd and combined with £80 million gross purchases, it signaled an anticipated springboard for a title ascent in 2011/12. Ground advantage would tweak the balance back towards the hosts, but City would expect to win this type of matchup by an average of around eight tenths of a goal over many repetitions. An average goal expectancy of 1.7 goals for the visitors and 0.9 for the hosts, equating to a win expectancy of 55% for the aspiring champions was in line with most pre game predictions. The actual result, 3-2 to City reflects as accurately as it can the expected difference in ability between the two sides, but twice as many goals were scored compared to the average outcome from such a meeting. Therefore it may be more instructive to roll the scoring process back one step to see if the performances of each team was fairly typical of such matchups and the actual result was simply a less likely, but not prohibited outcome. A Manchester City side with sights on the title would record a 3-2 victory at a team such Bolton around once in 40 visits. Quality Of Bolton's Goal Chances At Home To Manchester City, 2011/12. Bolton created and attempted seven goalscoring chances and they are arranged in chronological order in the table above. The colour coding represents the percentage chance that each shot would, be on target (blue), blocked (gold) or result in a goal (brown). The first attempt, a free kick from Eagles that Hart palmed away came as early as the third minute. In order of likelihood, this particular attempt could have missed the target, been blocked or been on target. The distance and angle of the free kick made it a longshot that a goal would result directly from the kick. Bolton started the match brightly, but didn't manage another attempt following Kevin Davies' 63' effort that bought the game to it's final 3-2 scoreline. Around half of the attempts represent genuine scoring opportunities. 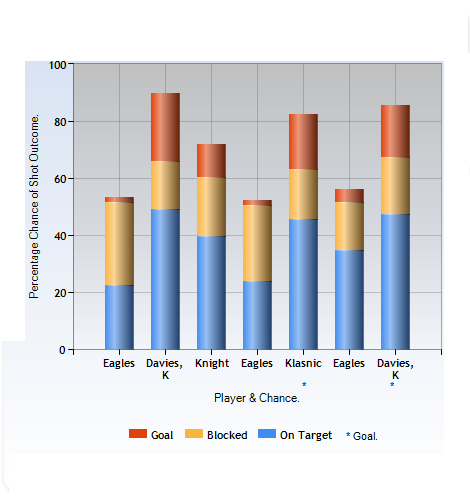 The two chances that fell to Davies, one of which he converted and their opening goal that was scored by Klasnic were each likely to result in a goal between 15 and 25% of the time. Others, notably Eagles' attempts were more speculative. An average attacking side presented with the seven chances that fell to Bolton would reap an average return of around eight tenths of a goal. That's a figure that was very close to Bolton's pre game expected goal average based on their attacking prowess and City's defensive ability from the previous year. So the slightly more extensive shot data is telling us that Bolton's attack performed largely to expectations and it was to the credit of the strikers that they turned an expected eight tenths of a goal's worth of chances into two actual goals. On another day they may have drawn a blank. Quality Of Manchester City's Goal Chances Away To Bolton, 2011/12. City not only produced many more goal attempts than did their hosts, 18 compared to seven, but they also carved out twice as many genuine scoring chances. Milner, Aguero, Dzeko, Silva and late on as Bolton sought an equaliser, Tevez and Johnson each had opportunities that were the equal or better of the host's best. It's noteworthy, rather than a repeatable team trait, that City scored their goals from three of the more unlikely opportunities that fell to them in August last year. Much better chances were created but failed to produce a goal, further indicating the random component that exists when the talent being exercised has success rates that seldom vary much above 1 in 4 and often fall a lot lower. Skill and randomness, two forces that ensure the best team doesn't always grind out a win, especially in a relatively low scoring sport. As with the Bolton example we can, in lieu of grouping together similar matchups, compare the outcome expectation from the 18 shots rather than relying on the smaller three goal sample as an indicator of performance. If we again concentrate on the "goals for" column we find that the 18 shots would yield on average just over two goals. Again this is close to the value of the Manchester City pregame goal expectation derived from historical records for both teams. How Cumulative Expectation Compared To Reality. Team. On Target Shots. Blocked Shots. Goals. In short, both teams had created chances that over the long term would yield the kind of average scoreline that we would have predicted for a clash between the Bolton and Manchester City teams of the previous 30 + games. The goal glut materialized partly because of the uncontrolled order at which chances are converted into goals in a highly competitive arena. On another day a similar range and quality of chances could lead to few in any goals. A 1-0 victory for the visitors should be played out on average once every eight such trials, even with shots arriving at a rate of one every four minutes. The Five Chances That Were Converted In The Bolton Verses Manchester City Match. Analyzing shots is a fertile ground for investigation and the addition of pitch position enhances any conclusions. As a descriptive and analytical tool it can be used to explain the match scoreline or in a wider, more extensive context to highlight teams or players who consistently under or overperfom against the norm. Just as importantly, a deeper understanding of how chances become goals can help to show that even seemingly elevated levels of scoring actually flow naturally from in game events. I'm curious how you calculated the shot outcome probabilities here. Are they based only on this dataset or on a larger sample of shots? Also, are they just a function of x/y position or are there other variables involved? Finally, just to clarify, shots on target here are shots that would have gone in without intervention by a defender, but not the keeper (those are blocked shots), right? the probs are based on a larger dataset comprising goal attempts for most of the teams currently playing in the Prem. X& Y co ordinates are the only inputs used, although other variables are obviously important but currently unavailable generally. Your understanding of how I've defined shots on target and block shots is correct.